Since I haven't played actively in ages so I might as well share most of my stuff since it's not like I use it anymore. I'll start with saves but I'll add more stuff later. Here's my old release threads. The download links in the threads might not work anymore so I've added them separately below and also it's nice to have all my stuff in one place. What? I didn't make a release thread for DM Church? It's the old save from days gone by. Then for the main course. My save folder with 271 cherrypicked saves, 98 of which are mine. Old stuff from all the way back in 2009 too. The rest is stuff I've saved from other servers and things I've contributed to but are not actually mine. I also packed in some old saves (~2006) from when Blockland was being developed like the island in one of the default screenshots. Server builds folder has larger stuff like freebuilds and themed servers. Things worth checking out in "mine"
If you use any part of any save from any folder with "mine" in the name I'd appreciate if you gave me credit somewhere in your build/server but you probably won't anyway and to be honest I don't really care. I wouldn't recommend using things from any other folders as the builds aren't mine. If you have questions about any save or build in the save ask away, I remember some of these things frighteningly well. Pardon the lack of better previews, some of them are just me looking at the ground or similar. I really don't feel like taking a new shot of each save. Insignificant update on 2014-07-31, removed a couple duplicate saves. Behold my ImageMagick (ie. Googling) skills! 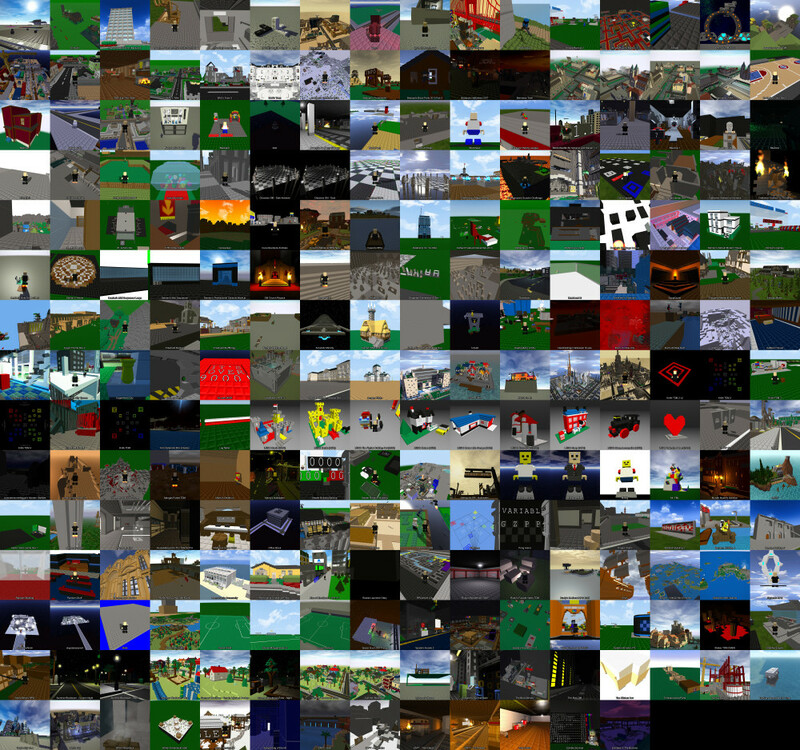 A collage of all the save previews in the archive with the save name overlaid. Sorry it's a 9600x9000 image but you need to see individual previews. Click for full res, please don't hotlink the full res image. Here you go. Almost every add-on I've ever made, including unreleased & commissioned "private" stuff that nobody cares about (E.g. Weapon_SwordFlipped for Fob.) and a couple updated add-ons. Titanic and elm's RPG stuff not included for obvious reasons. Sorry, no descriptions or screenshots in the foreseeable future. I need to learn more PHP before I can add them. I can't guarantee all add-ons work or are even finished, I didn't test them. Funny thing about the coffins, I believe I started working on them just before Badspot released the first screenshots of the Halloween update, so that died. I believe you're supposed to turn of the collision from them and build a box of invisible bricks on top of the coffin so you can actually use them as coffins. Notes on things. Text formatting and playertypes aren't written by me but I found them useful. A bunch of PSDs, blends and files from that Torque Script Class that someone held years back. To improve searchability. List all the things! Where does everyone get that topic title or make it? Woah, there's a ton of great saves I've seen just from the images I looked through so far. Stuff like this really makes me wish more great saves didn't just disappear because the builder didn't give it out/host it. So i ask him or Is there a link? Does this mean you're leaving? Great stuff though. i'm pretty sure it's just a super dump slump jump! No. I haven't played actively in a long while so none of this stuff does any good for me or anyone if it just keeps gathering dust in my files. There's a lot of cool stuff in here, including saves I've lost over the years. Omg you do not know how happy you made me when i saw your ctr map on here thank youu. I made it in Photoshop. That's one of the mod resources I intend to release. Custom Blockland style title PSD. What's your BLID? 2065. I can send you every brick you've ever made that I have saved in like five minutes. I have 699 saves in my save folder so I just released the top 40% of it. Edit: Only found your bricks in Bisjac's Server and Halloween NWB and both of them are in the archive. But since you can't build a space station with four bricks. What are your alts? Nice, What Font did you use? Added a collage to OP.